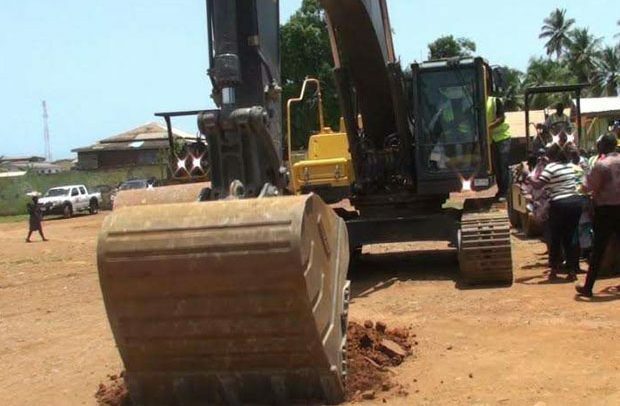 The Roads and Highways Minister, Akwasi Amoako Atta, has cut the sod for the commencement of the construction of Axim town roads in the Nzema East Municipality of the Western Region. According to the minister, the ceremony held at Axim last Tuesday was in fulfilment of a promise made by President Nana Addo Dankwa Akufo-Addo in his recent visit to Axim. Addressing the people during the Kundum Festival of the chiefs and people of Axim recently, the President gave an assurance that construction work on Axim town roads, which the previous National Democratic Congress (NDC) government promised to do but could not fulfill the promise, would soon commence. Hundreds of ecstatic people in and around Axim therefore joined the Roads and Highways Minister and his entourage at Axim Victoria Park to celebrate the cutting of the sod to commence the construction and asphalting of the Axim town roads. The minister was in the Western Region for a two-day working visit during which he inspected some ongoing road projects in the region. The initial 6.5 kilometres Axim town roads which would be completed within 12 months and being constructed by Justmoh Constructions, would cost GH¢12 million. Addressing the gathering, the minister told the people that the President was a man of his words and that government would fulfill every promise made to the people. “The President was here to inform you that the Axim town roads would be constructed to restore the ancient coastal town to its glorious days and true to his words he has sent me here to cut the sod for the project to start. Let me tell you that the contract for the project was awarded in October this year and it will take 12 months to complete it”, he pointed out. He indicated that other feeder roads in the municipality would also be constructed under the ministry’s feeder roads system. He mentioned the Gwira Anyinase-Wiawso road which was partially engineered, the Gwira Banso, Bamianko and Tebakrom feeder roads. He assured them that a steel bridge in the Gwira area which had developed some faults would be fixed. He warned that no contractor who had duly been paid for a project but failed to executive or abandon that particular project would be allowed to go scot free. “Under the current Akufo-Addo government, contractors who refuse to carry out projects they are paid to do would be made to face the full rigors of the law”, he stressed. The Western Regional Minister, Dr Kwaku Afriyie, noted that construction of deplorable roads in the Western Region would inure to the benefit of the whole country. He explained that the region produced a chunk of the country’s natural resources and needed good roads to facilitate easy transportation of those resources to the market centres and for export. The Member of Parliament for Evalue-Ajomoro-Gwira, Catherine Abelema Afeku, was grateful to the President for honouring his promise to the people by fixing the deteriorating Axim town roads. She appealed to the contractor who would be carrying out the project to do well to employ local people, particularly the qualified youth when the need arose. The Nzema East Municipal Chief Executive, Frank Okpeyen, pledged that the assembly would collaborate with the contractor to ensure the project was completed on schedule.